Escape to this tropical paradise every year in any week you desire! RTU in perpetuity! Buyer may receive a title fee credit, inquire for details! 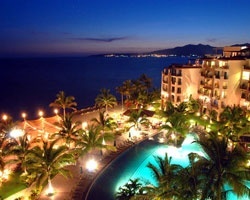 Let the *Villa del Palmar Flamingos* resort be your home away from home in Nuevo Vallarta. Enjoy the expansive swimming pool that extends the entire length of the resort, from the Lobby building to the beachfront restaurant and pool-bar below. The pool features a zero-entry wheelchair access area, a large play area, a tanning area in three inches of water, shallow sections, swimming and exercise areas, and all complete with waterfalls, water spouts, and arching fountains. With the quaint town of Bucerias to the north, and the lively city of Puerto Vallarta to the south, whatever you are looking for, there is no place better to be! Discover more by visiting www.villagroupresorts.com. *Interval International Elite Resort* Featuring a finely appointed 1 bedroom, 1 bath suite that will accommodate 4 guests comfortably. Usage is annual in a floating week. RTU in perpetuity. For more information or to make an offer, please submit the inquiry form.